I think people need to think for themselves. I also think people are looking for external saviors all of their time. tigers aren't chasing us any more. But we still want to feel alive. best way they know how. sitting quietly, until the storm water rushed off the surface of their minds. make everything right this time. There won’t be any leaks springing from this one. don't like the things you're feeling. That's the most important time to open the gates and let the water drag you down, washing you clean in the process. past what someone is capable of absorbing and risk a longer road of recovery. you have 15 minutes of time for yourself today? Then again tomorrow. And the next day. again. Uncomfortable is where growth lies. What gauge are you using in life to move yourself forward? What itches are you letting fester until you need an emergency room to cut out the lesion? What could you stop ignoring now and change everything for yourself? It only takes on pinprick to start. load. Maybe the first thing that pops into your head. You can do it. And sit still for 15 minutes. is an intuitive coach, teacher, and writer in Durham, North Carolina. She thinks of everything as energy work and all people as whole. When not working online or in-person with clients Sam is usually in the woods with muddy feet and leaves in her hair. Reader Question: I have everything I need to start my new strength-training regimen. I’ve joined a gym and got my program. I’ve plugged my training days into my schedule, and I’ve even got workout clothes that I’m excited to wear. And yet, I’m still very intimidated about stepping onto the gym floor and I haven’t gone yet. Any advice? You might know this feeling, too. You’re excited to embark on a new program that looks so fun and that you know is great for your body, mind, and health. But still, unfamiliarity and uncertainty are holding you back from getting started. To help get you over the hump and on track, I called upon a little help from my favorite fitness friends — and my own experience — to deliver you advice and strategies for overcoming gym-timidation. The number one rule of making progress towards any goal is simple, in theory: Keep showing up. But how do you show up when your nerves keep you from even opening the door? 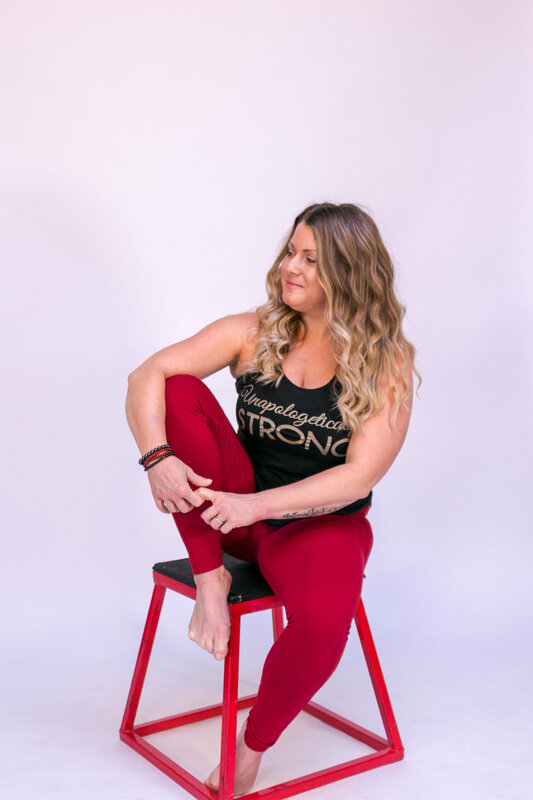 “Your community will make or break your consistency with your fitness journey and beyond,” advises Rachel Black Graves, owner of Bloomfield Fit Body Bootcamp in Connecticut. To make getting started easier on yourself, do bit of research on the front end to find a space where you feel comfortable and welcome. Find a spot that meets your needs right from the get-go, before your first step onto the free weight floor, because if you’ve joined a gym and you’re feeling extra nervy about starting your routine in a new space, that may be your spidey-sense telling you something isn't the best fit for you. Next, check out videos, pictures and past events of the gyms you’ve located online. (Side note: You may work out at home alone but you're interested in joining an online training group. The following recos still apply.) Read member reviews, and ask around: What are others saying about them? If you’re nervous about starting your workout regimen in a new gym it can be easy to let your thoughts run wild, on the negative side. “What if no one is friendly? Will they know I don’t know what I’m doing?” Left unchecked, those thoughts can snowball your nerves into a full on fear that keeps you away from the gym — and from getting started. Listen, as a former overly shy kid and teen who’s nerves led to awkward moments akin to Baby-from–Dirty Dancing's "I carried a watermelon." And I’ve learned that the best way to quiet those negative voices down is to talk right back. Nicely, of course. Positive self-talk is a straight forward approach: Talk to yourself in a positive way, the way you would talk to a colleague or friend who needs more confidence, but to yourself instead. Repeated mantras of “I am strong. I can try new things. I can take it on one exercise at a time," will help increase your confidence and overcome fear. We all have fears that threaten to hold us back. But instead of letting fear keep you away from the gym, reframe your thought process where you use curiosity to overcome intimidation. Ask,“ I wonder what cool stuff they have? I can’t wait to see all the awesome lifting going on. Ooooh, they have snacks!” With this approach, consider the scenario that you are not under the gym microscope, but that the gym is under yours. What do they have to offer you? What opportunities are there for you to learn new things? Instead of feeling intimidated by veteran members, who can be your inspiration and role model? I was a lucky kid: We had a pool in our backyard of the house I grew up in. It’s fine to take the same approach when starting a new routine in a new space. Look at your program and pick out the moves you’re most familiar with. Practice at home, with or without weights, picturing doing the same moves at the gym. Know where the equipment you need is located (because you took a tour, remember?) and if you can, plan to go when you know the weight room isn’t packed (if you aren’t sure when this is, ask a staff member). Do the exercises you know and go home. Familiarity breeds comfort and feeling comfortable makes trying new things easier. Repeat the process the next time, nudging yourself to expand your routine as you go, until you’re doing the whole routine. Give yourself grace to get used to this new thing you’re doing. It doesn’t have to be perfect right from the start. By choosing your best space and taking charge of your mindset and approach you can create an experience you ’ll love showing up to, over and over again. And in time? The inspiration for the new person who just joined your gym is you.